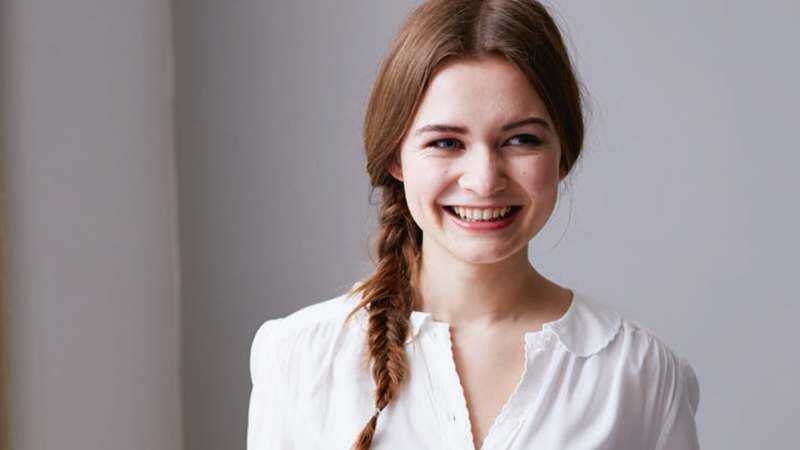 Martha Collison, who was only 17 years old when she competed on BBC’s The Great British Bake Off, became the face of perpetual sunniness on a show already beloved for its pleasantness and lack of manufactured drama. What’s even more impressive than Collison’s prodigious baking talents, was that she was beating out the competition week by week while studying for her university-admissions exams. The A.V. Club: There are hundreds of books about baking on the market. How did you make yours stand out? Martha Collison: I’m just a 20-year-old student, and I basically took the way I bake and putting little twists on it to make it more exciting. The book came about by me realizing you only really need one good recipe for each—one good brownie recipe, one good vanilla cake sponge recipe—and as soon as you’ve got that basic nailed, then you can do whatever you like with it. AVC: You were 17 when you competed on the show. What have you learned these last three years about baking that you didn’t know when you were on Bake Off? MC: I’ve learned so much. Even when I was doing the show, I learned loads in the preparation, and from Paul [Hollywood] and Mary [Berry] giving their critiques. And even from the other bakers. You look around the tent, and you see all these people use different skills I didn’t know or ingredients I’ve never seen. And you learn so much in that experience. Since then, I’ve been so lucky to be exposed to great food in London, and being able to write books means I’ve been able to explore ingredients and explore British baking heritage. It’s just been really exciting. I’ve become so much better than when I was on the show. AVC: The thing that resonated most watching Bake Off was the British culture of baking was not limited to one gender, one age group, one demographic. You could be a 17-year-old student or a 65-year-old banker. What is it about the baking culture in the U.K. that people in other parts of the world might not understand? MC: I think baking in the U.K. is central to every family event. There’s always a birthday cake, a dessert, and you put a lot of love into the food you’re making. British people love that polite tradition of making something and sharing it. That’s what the show epitomizes. There’s a lovely atmosphere you see in the tent. Everyone’s supportive, and everyone wants everyone to be well, and that’s genuinely how it is. Everyone loves eating a good cake, sharing a good biscuit. That’s what we try and do. AVC: For a country whose cooking competitions are loud, bombastic, and more about personalities and conflict, is it surprising how big of a hit Bake Off has become in the U.S.? MC: I am really surprised. I’m very humbled by the amount of people who message me saying they’ve watched it in various locations across the States, and how much they like seeing something where everyone is so lovely to each other and everyone is very caring. It’s very true to how the program is. I never once felt like it was competition. People are also surprised there really isn’t a prize. There isn’t a cash prize. Really, you only get a little cake stand if you win. But it’s a big deal in the U.K. When I was on it, the finale of our series had more views than the final of the World Cup. The fact that it’s just people baking cake, it’s a bit crazy that it has gathered such a following. It just captures the diversity of Britain, and everyone can relate to it some way or another. AVC: How far in advance did they film the series before it aired? MC: Pretty far ahead. I found out I was on the show in February, and we filmed from April to June, and it started airing in September. So not a massive difference, but it feels like a long time when you’ve had to keep it a secret. AVC: They filmed this on weekends and you attended school during the week. Did you just not tell your friends where you were on weekends? MC: That was probably the toughest thing. We were allowed to tell a very minimal number of people. The only people who knew about it were my immediate family, my teachers at school so they could be lenient with my homework, and very, very few close friends. It was really tough for all of us to lie about where I was and how I was doing, especially not knowing how many weeks I’d be in the show. I ended up being away for eight weeks, which is a big part of your life. AVC: How were you able to study for your examinations while preparing for the show? MC: It was an interesting challenge that not many people have faced. I was the only other contestant who wasn’t studying at university, but at school exams. They’re quite important in terms of if I wanted to go to uni in the future. I was thinking, “Will food be my career, or will I not do well in the Bake Off and I’ll have to study a normal degree so I need to make sure my grades don’t suffer?” I studied math, chemistry, and food technology. I was doing papers in between challenges on the show. We’d go back to our bakers’ room over lunch break, and I’d bring out my chemistry textbooks, and the other bakers would look at me like I was crazy. AVC: How much information did show producers tell you beforehand, like what dish you’d need to focus on that week? MC: About a month before we film anything, they’d send a brief each week up to about week nine, apart from the technical challenge—the challenge in the middle they’d always keep a secret right up until we took off the gingham cloth. But the other two recipes we knew, and we had to come up with an idea, so the producers knew that if we were in that week, they’d know what we’d make so they can check there weren’t any clashes, or that we had the ingredients ready. We knew what the challenges were, which made it more painful if you left early in the competition, because you were ready to do the weeks ahead. People always think, “Well, if you knew ahead, surely you’d practice them loads and you’d be really good.” But you never want to get ahead of yourself. When it’s week one, all you practiced was week one. When you’re in week two, all you practiced was week two. You don’t jump ahead and try to perfect your pork pies, because you can’t take anything for granted when you’re in the tent. AVC: Hosts Mel Giedroyc and Sue Perkins seemed very protective of the contestants. I heard they would sabotage a shot if it showed a contestant in an unflattering light. Are they like den mothers to you? MC: They are. The production company is lovely, but there’s always a slight conflict of interest, because the show is happy and lovely, and everyone’s very supportive. But at the same time, they need to film when you’re upset, when you’re angry, all the natural human emotions when things don’t go right. Mel and Sue just don’t want anyone to see that negative side of you when you’re really upset. I remember once when I was really upset over some eclairs. Mel came up to me and started doing a weird dance and singing a song. I didn’t understand what was happening at the time, but looking back, it was her making sure the footage wasn’t able to be used. They’d do that to other people as well. It’s nice to know you had that protection, because it’s overwhelming having your life looked into so deeply. Every little thing you do is critiqued quite harshly, so having them looking out for you in the tent was so lovely, and it really wouldn’t be the same show without them. They really make it with their humor and how they genuinely care about us. AVC: It really isn’t going to be the same with Mel, Sue, and judge Mary Berry leaving the show. How do you feel about this new iteration of Bake Off with 75 percent of its original cast gone? MC: It’s a very mixed feeling. It makes me feel grateful I was part of the original program. I started watching the Bake Off when I was about 12, 13, and I was on it when I was 17. So I grew up being inspired by the program. I’m really pleased I was able to experience it, and I loved every minute of what I got to do and where it’s taken me now, working in the food industry doing something I love every day. It will change, and I just hope the experience for the new contestants will be the same, and that they enjoyed it as much as we did. AVC: The only holdover on this new Bake Off is judge Paul Hollywood. Were you ever subject to that Paul Hollywood death stare, where he’d look at you silently for a few seconds before telling you how he felt about your bake? MC: That is definitely the most intimidating part. He can always go two ways. He does the stare, and then he’ll either go, “That’s the best thing I’ve ever tasted” or “That is disgusting.” And you just don’t know which way he’ll go. I had one of each. There’s this thing he does as well where he takes his finger and he prods into a bread or a cake to see if it’s baked properly. And that’s another intimidating thing. AVC: And he doesn’t say anything. He just prods, looks at you, and walks away. That seems frightening. MC: Mary was different. She’d come along, give you a little wink and a nod. 1. In a large, microwaveable mug, mix together the butter and sugars. Microwave on high for one minute, making sure to stir halfway through. The sugar and butter will start to melt together. 2. Leave the sugar to cool for a few minutes, then beat in the cocoa powder followed by the egg. Fold in the ﬂour gently; you don’t want too much gluten developing, because it will over-rise and be tough, not chewy. 3. Transfer half of the mixture into another mug or ramekin (you can refrigerate this and microwave it later or share with a friend! ), then sprinkle the chocolate chips over the top of both. 4. Microwave on high for 30 seconds. The brownie will rise and fall a bit while it is cooking and should still be slightly gooey when done. Leave to stand for a few minutes to allow the heat to disperse evenly before enjoying with a large scoop of ice-cream! You could bake this in the oven instead of the microwave at 350 degrees Fahrenheit for ﬁve minutes to get the crisp top; just make sure that the mug is ovenproof. 5. Serve with a big dollop of whipped cream and chocolate shavings, then get stuck in with a spoon! Recipe reprinted from Twist: Creative Ideas To Reinvent Your Baking. Purchase Twist here, which helps support The A.V. Club.